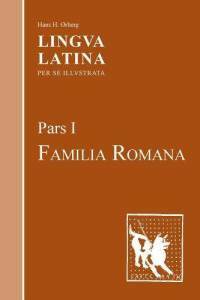 High school Latin II is a continuation of High School Latin 1 using Hans Orberg’s Latin Lingua: Familia Romana, Students will begin at Chapter 12 and continue to Chapter 24. Students must have mastered 1st, 2nd, and 3rd declension nouns, present and passive voice in the present tense, all five cases, imperatives, place clues, and demonstrative adjectives before beginning Chapter 12. This course will continue to focus primarily on translating and learning vocabulary. Grammar includes 4th and 5th declension, participles, all active verb tenses, the supine, and deponent verbs. High School Latin 2 is designed to be a yearlong class with weekly homework. Students will be graded by submitting voice recorded translations and exercises completed on-line or from the workbook. Exams will be administered at the end of each semester. Enrolled students will have password-protected access to the syllabus, audio readings, video tutorials, worksheets, and helpful links: HERE. This class meets every Thursdays @ 10:00-10:55 at LEAD Homeshool in Decatur, Ga., starting September 6, 2012 and follows the LEAD calendar. The cost of High School Latin II is $240 per semester.